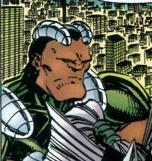 Basher was one of the more ambitious members of the Vicious Circle, acting independent from orders issued from OverLord. He was also the villain responsible for the original Star only attempting crime-fighting once, suffering a brutal beat down at the hands of the criminal superhuman. Alongside HellRazor and Mako, Basher was marked for death by OverLord who arranged for the newly cybernetic SuperPatriot. He was unleashed upon the trio to prevent them from getting any more ambitious but he succeeded only in killing Basher before being taken down by Dragon.